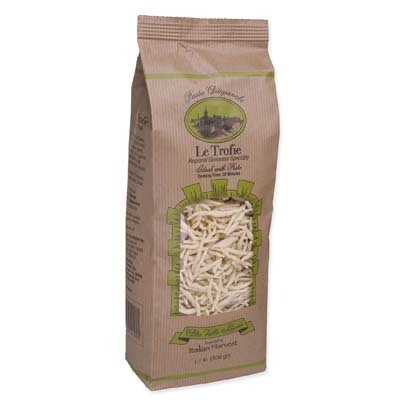 One of the more interesting pasta types that’s typical of the Liguria region, this bag of Trofie is from artisan pasta maker Alta Valle Scrivia. This pasta is best with pesto alla genovese, green beans, and potatoes. With 100% all natural ingredients, it’s a beautiful organic pasta that has a soft texture and delicate flavor when you cook it. Simply perfect with a batch of fresh basil pesto. But then who’s to say you can’t serve it with any of your favorite sauce? Ragu alla Bolognese and carbonara sauces would still be great with this. Don’t you think? This pasta is delicious…I will buy it again! Even if it is as simple as adding olive oil and parmesan in it, it still tastes heaven.